I love that my favorite teams AHL club is just down the street from me. I got to see a lot of stars before they became Stanley Cup champions. Not bad. Not bad at all. Marc-Andre Fleury- The Flower spent parts of four different seasons with the Baby Pens, playing in 82 games for WBS. His 1.49 GAA and .938 save percentage helped Wilkes-Barre/Scranton to a 13-0-1-0 start in 2005. Max Talbot- Superstar played for WBS from 2004-06. A fan favorite before he was a superstar. Tyler Kennedy- In 2006-07, TK had 37 points in 40 games. His first professional season was spent entirely in Wilkes-Barre/Scranton. Miroslav Satan- Satan was a true professional when the trading deadline and salary cap put him in Wilkes-Barre for 10 games. I witnessed a shootout goal in person. Woooo. Rob Scuderi- Scuds played in NEPA from 2001-06 appearing in 300+ games. Kris Letang- Letang and his hair only played in 11 games for Wilkes-Barre. Good thing. We need him in Pittsburgh. Brooks Orpik- Spent his first two pro seasons as a member of the Baby Pens. It doesn't feel like 6 years since he left for Pittsburgh. Alex Goligoski- Because he played in more than 40 games for Pittsburgh, Goligoski will have his name on the Cup. That's something they can never take away from you. Good for him. Dan Bylsma- Disco Dan wasn't the head coach in Wilkes-Barre/Scranton for long and now he is Stanley Cup Champion Head Coach Dan Bylsma. That's just storybook. 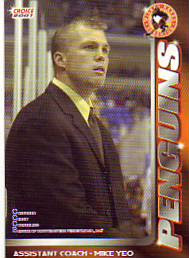 Mike Yeo- Yeo was an assistant coach in WBS for six seasons. 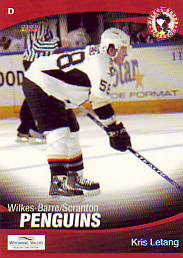 He also played here as a player in Wilkes-Barre/Scranton's first season in 1999.